Several national newspapers are today reporting that Everton are set to make a move to sign Birmingham City and England U21 winger Nathan Redmond. With Birmingham ready to sell, a number of Premier League clubs have been quick to register their interest in the promising attacking talent, with Roberto Martinez a reported long-term admirer. Nathan Redmond burst onto the scene as a 16-year-old, becoming Birmingham City’s second youngest player of all time when he made his debut in a League Cup tie against Rochdale. He has since gone on to make 82 appearances for Birmingham and was a virtual ever-present last season, starting 38 of their 46 league matches. Redmond plays in much the same way as Aaron Lennon, using his blistering pace and low centre of gravity to burst past players. He still has much to learn and his talents remain incredibly raw, but with a fee reported in the region of £2m to £3m, he would represent a good gamble for the Toffees to take. Redmond typically plays wide right, but has at times played for Birmingham on the left hand side. His end product is currently hit and miss, often leaving defenders for dead, but then failing to pick out a team-mate in the box. This is characteristic of many young wingers and his game will develop as he matures. If Martinez decides to pursue his interest, Redmond would likely be seen as player for the future, with his immediate playing time limited to making an impact off the bench. Previous Post Fellaini: Will he be with us next season? 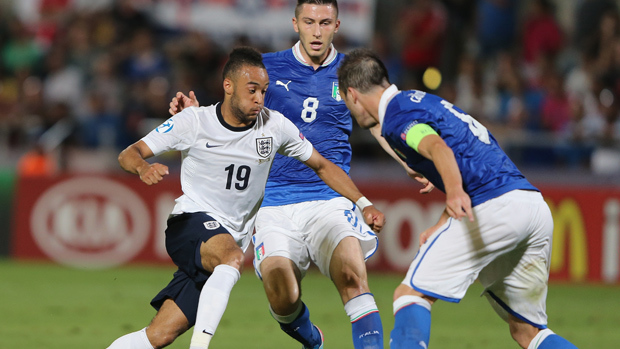 Nathan was one of the few England players to emerge from the recent U21 tournament with credit. Having seen him progress over the past few years he’s definitely a player with talent and will graft when required as well. Is definitely worth a punt and Everton would be a good choice.